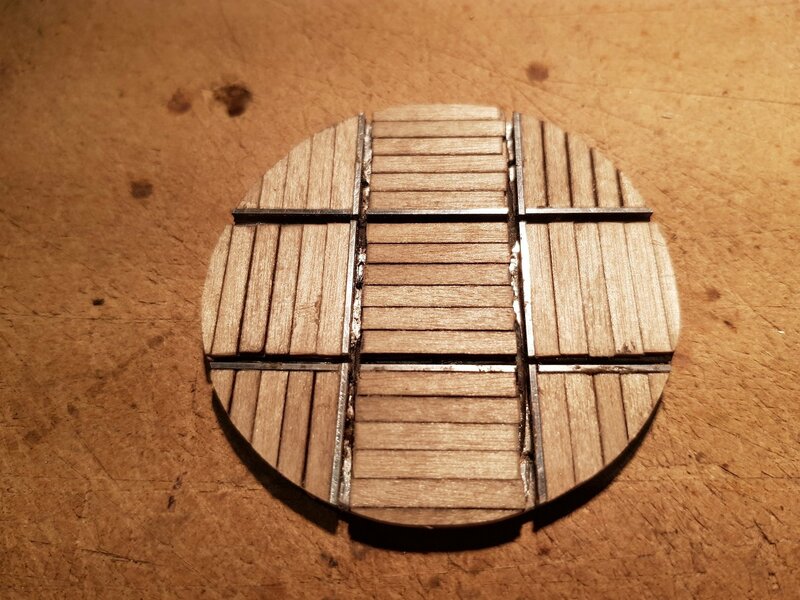 As part of the Port Cumtha layout, I needed to make two wagon turntables. 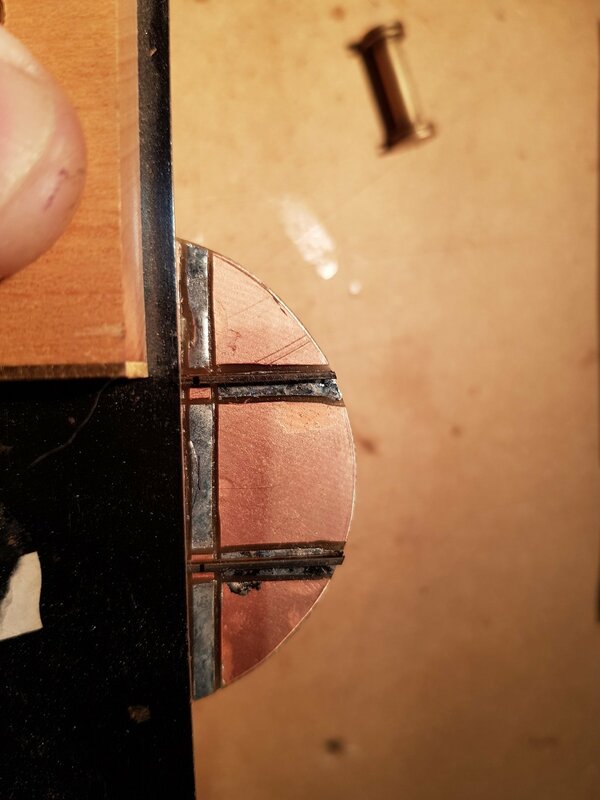 I settled on using the Copperclad method as it is easier to fix and space the rails. Don't really know if this is a tutorial, perhaps a bit more of "this is how I did it", but here goes. 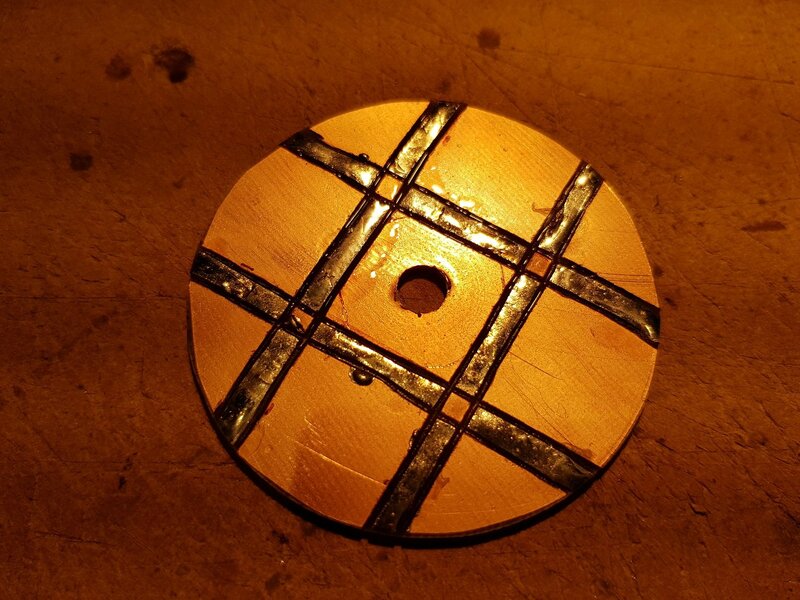 I started by cutting out a 60mm disk from a PCB sheet with a hole saw and marked a circle which is 21mm diameter to indicate the position of the track. 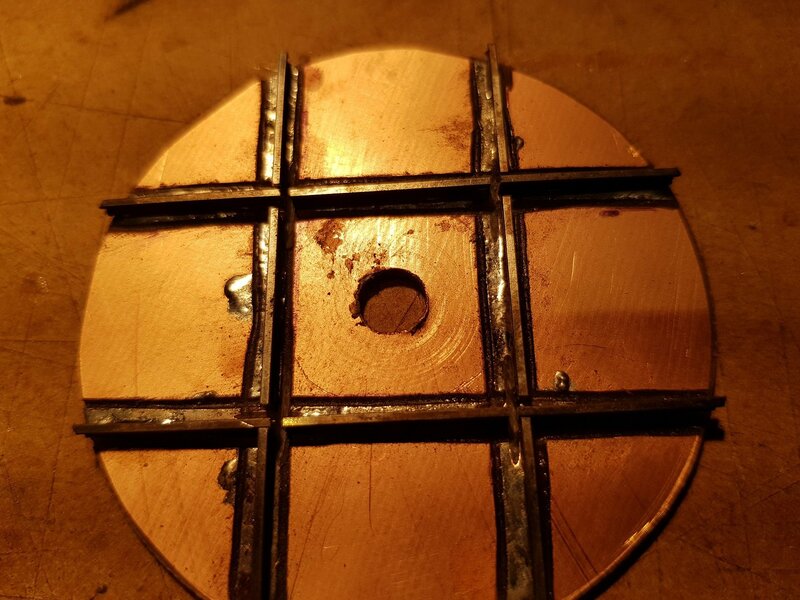 Electrical conductivity needs to be addressed, so I marked out tracks where the rails would be and scored the lines with a cutting disk just to break the copper into areas. Rails were tinned with a little solder and fixed down in place using the 21mm gauges. 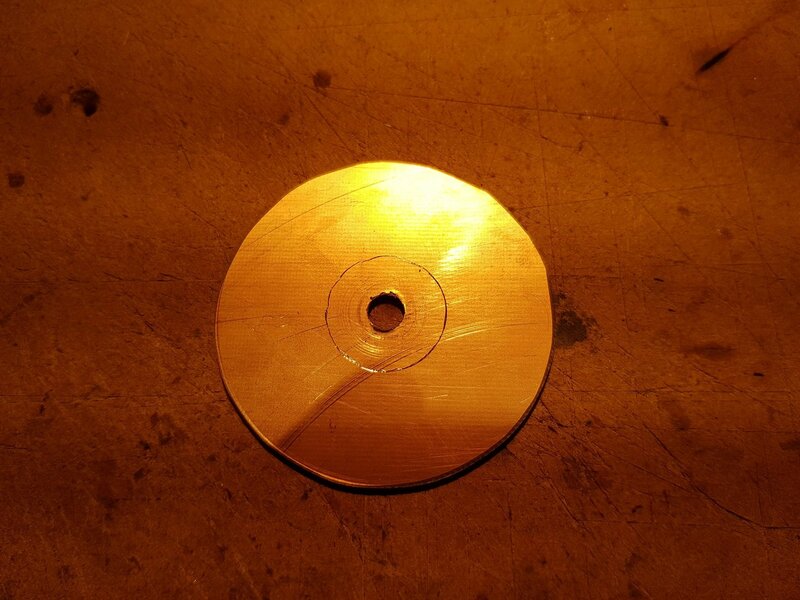 The rails can now be trimmed at the edge of the disk so they don't catch. 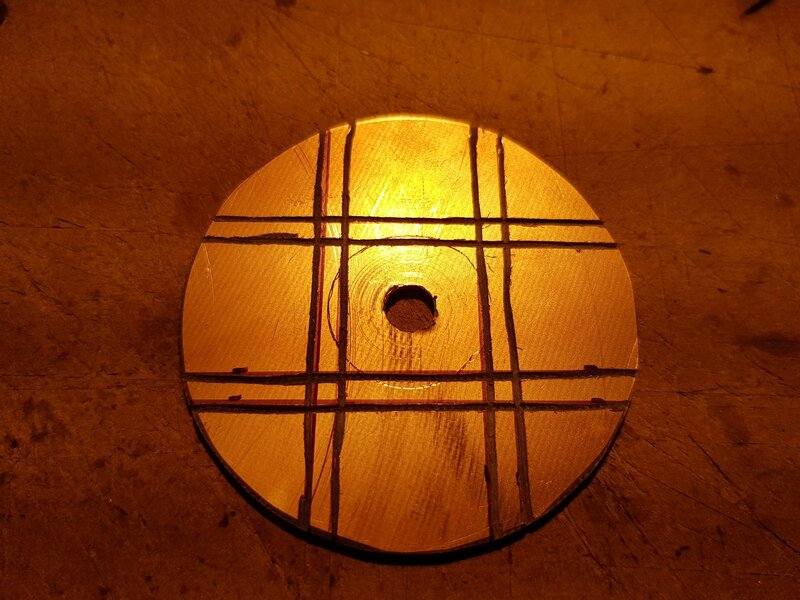 The crossing rail is squared with the main rail, and crossing points marked to be cut with the cutting disk. 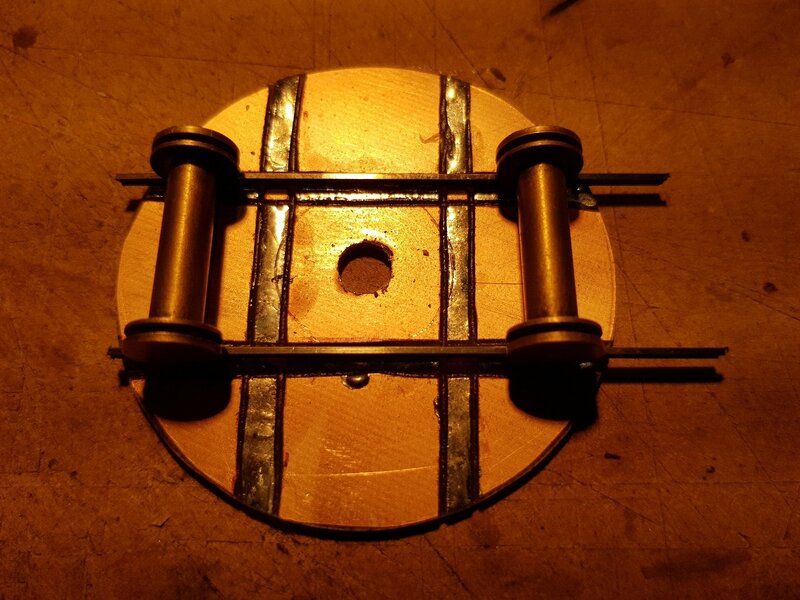 The rails don't appear to line up with the tinned lines on the disc, but this doesn't really matter as long as the rail has contact with the solder on the track below and doesn't cross onto another section of copper. The two crossing rails are added after cutting the primary rails. I set in the first rail, then used the gauges to mark where the second rail would cross, and then cut the second rail. Once all four rails are in place, judicious use of the cutting disk is needed to trim the inside rails to allow the wheel flanges pass. Top left cut is a little loose as some fettling of the groove is needed to ensure the correct back to back gap on the rails. 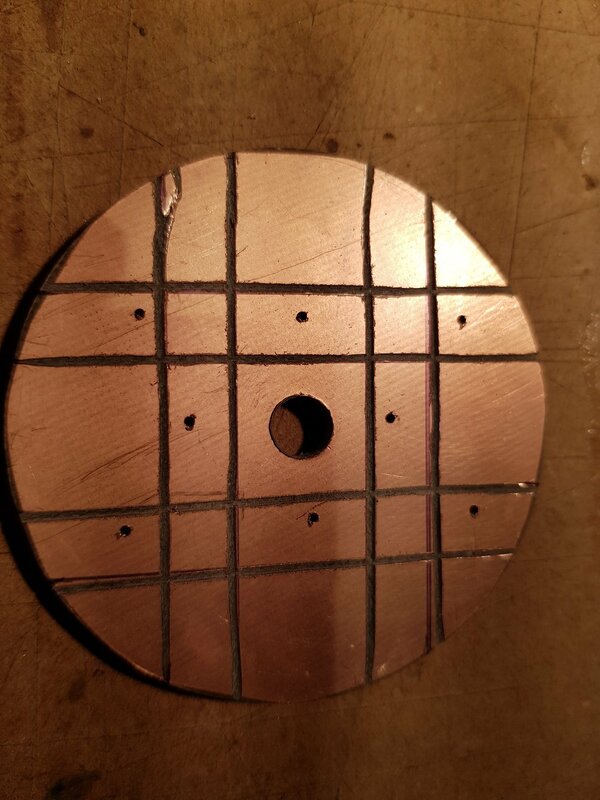 This can be filled with solder later if required - this is a close up, and at a distance, the gap will not really be noticeable, so I'll see how it looks later. As these turntables will be live, some form of electrical connection is needed. I decided to score the back, similar to the top and drill fine holes through for droppers. Some fine wire was tinned and passed through and soldered to the copper below. 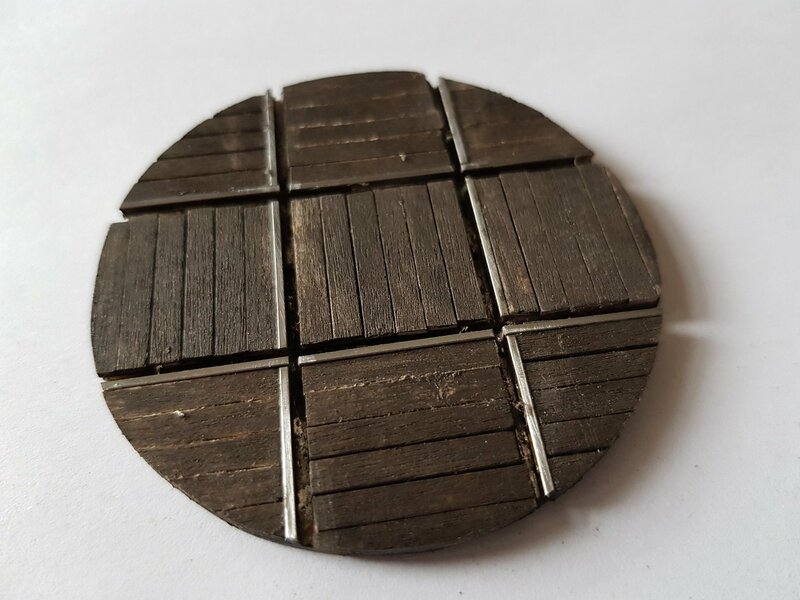 I propose to use light springs & perhaps small ball bearings (or similar) located under the turntable lined up to contact the copper area, which will allow power to the relevant sections of track. I still need to resolve how power will be supplied to ensure no shorting, so it may be an either / or solution with locomotives only able to travel in one direction at a time - the perpendicular section of track will be dead when trains pass through. Trimmed sleepers were added in two layers, set at 90 deg to each other, to provide strength, and to build up the height to the rail head. 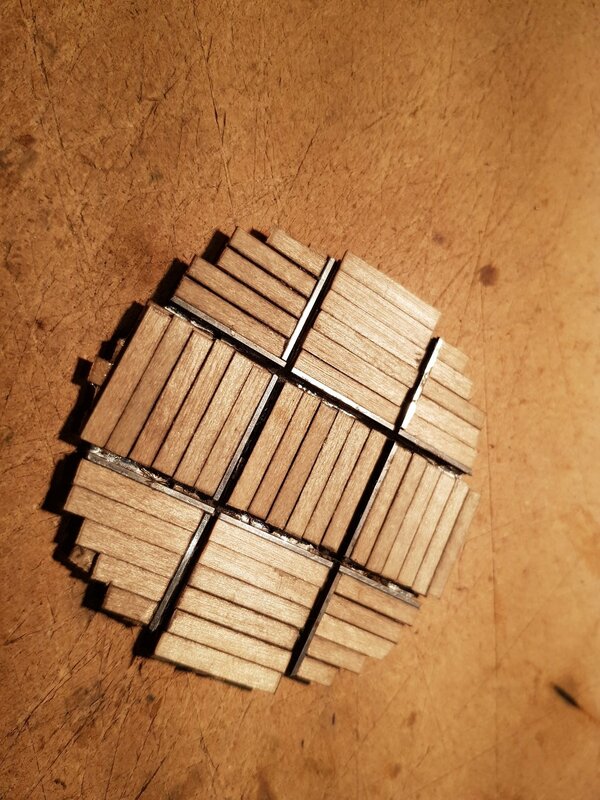 This was then trimmed on a sander in the workshop to provide that nice circle. The two layers provided the strength so that the smaller sections of sleeper would not break away when sanding. Painted sleepers to provide a finished look, and now for installation into the layout. Weathering and detailing will take the fresh look away and hopefully settle it into the layout. Power supplies & surround to be completed. I'll post a picture, once installed in the layout. Hopefully this will help someone in the future, or perhaps just provide some reading on a quiet evening. That is one seriously neat bit of work. Lovely job.